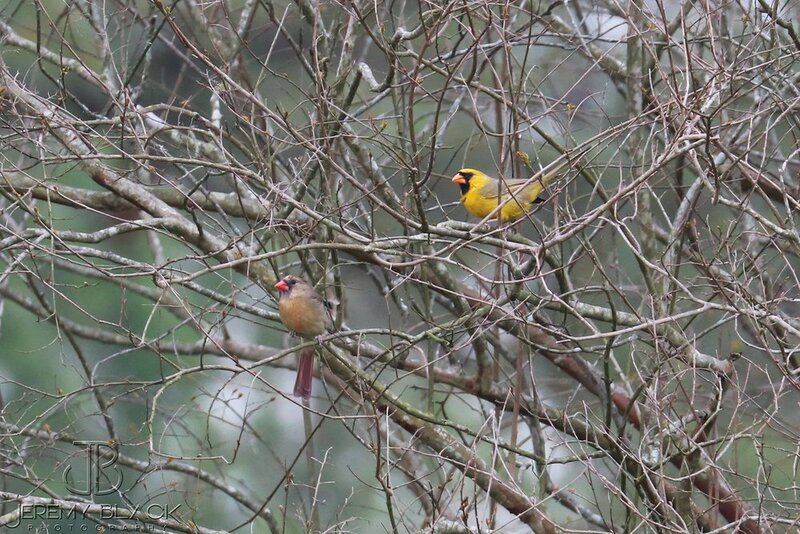 A year ago, thanks to photographer Jeremy Black and bird-spotter Charlie Stephenson, we broke the story of a very rare yellow Northern cardinal that had Charlie had discovered in central Alabama. The news and Jeremy's photos ended up going viral and spreading to major newspapers and magazines. Yesterday Jeremy just sent us another message with more news and a new group of beautiful images. "I wanted to share a thrilling update and numerous photos for your viewers who fell in love with the yellow cardinal," writes Jeremy. "One year ago today, the male Northern Cardinal with yellow plumage (now known as Mr. Yellow) was discovered in Alabaster, Alabama, by resident Charlie Stephenson. We are ecstatic to report that after 365 days, this particular Northern Cardinal is still residing in Alabaster and is safe and thriving. Throughout 2018, he's defied every obstacle thrown his way. This 'One in a Million' Northern Cardinal has found a mate, produced five offspring (none of which displayed the rare genetic mutation), and survived both predators and extreme weather conditions. Smoothies and açaí bowls are among the biggest food-related trends happening right now. They’re healthy, vibrant and—best of all—Instagram-worthy! Who can resist the sweet taste of fruit mixed together with crunchy granola and an ice-cold base on a hot and sunny day? But if you’ve consumed one of these cool and refreshing treats before, then you know what they are served in: plastic. And you know what you use to drink it, right? Plastic. Or to eat it? Usually plastic. And how about that lid to keep it from spilling? Oh, yeah … plastic! All of this plastic will be thrown away after one use (photo by Infrogmation Of New Orleans/Wikipedia). This past summer I worked in a bowls and smoothies shop. It was a great job and one that I will be returning to this upcoming summer. But what I saw concerned me. The shop was located along the ocean and almost everyone took their bowl or smoothie with them on the beach. Who wouldn’t want to get that perfect Snapchat with the ocean in the background? Bowls, cups, lids, spoons and straws were all likely disposed in trash bins … if disposed at all. These plastics have a high chance of ending up in the ocean by the end of the day, or of being consumed by seabirds. Our aesthetically pleasing trend is causing major damage to our naturally exquisite environment. Plastic pollution is contaminating the world’s oceans and it is only a matter of time until it completely takes over. Plastic poses threats to the world’s oceans, marine life and even the human race. Plastic straws—one of many single-use plastics—are among one of the biggest concerns, and one of the easiest to resolve. Single-use plastics are plastics that meet the following criteria: they have a short lifespan, are used for usually 15 to 20 minutes and then discarded to a landfill forever. In the United States, approximately 500 million plastic straws are used every day. In Manly, Australia, a diver named Kasey Turner found 319 straws in under a half an hour’s dive. The next day, she went back to the same location and found 294 in that same amount of time. These straws and other plastics are consumed by marine life such as fish and whales, and entangle and kill countless organisms. In Costa Rica, a video of scientists removing a plastic straw from a sea turtle’s nostril (which was blocking its airway) went viral, reaching over 11 million views. And in the recently released documentary A Plastic Ocean, seabirds in Australia were recorded to have over 300 pieces of plastic ingested per bird. According to A Plastic Ocean, an estimated 90% of all seabirds have swallowed plastic at some point in their lives. And it is said that by the year 2050, plastic ocean pollution will outweigh a number of the fish in our oceans. A green sea turtle choked to death on plastic (photo taken along the Alabama coast by Ryan Joseph Van Dyke and shared with us by his friend Taylor Root). How exactly is plastic bad? There are countless answers. Firstly, plastic never completely biodegrades. Over time it will break down into smaller and smaller pieces, but it will never seize to exist. In fact, it takes a plastic straw about 200 years to decompose. But that is nothing compared to the 450 years it takes for a water bottle to decompose or the 10 to 500 years that it takes a plastic bag. BPA—or bisphenol A—is found in the manufacture of cheap plastics such as straws, single-use containers and water bottles. This is only one of the many chemicals found in these products, and it is associated with health issues such as early puberty, infertility and breast cancer because it seeps into the food and beverages in which we consume. BPA has been banned in the use of producing baby bottles in Europe, China and Canada. In the United States and Australia, though, BPA can be found in receipt paper, soup cans, plastic-packaged food, baby bottles, water bottles and many more of our everyday items. It has been found that 92.6% of Americans over the age of 6 have detectable levels of BPA in their bodies (according to the Centers for Disease Control). Unfortunately, more than 2.6 billion people depend on the ocean for their primary source of protein, and they are consuming all of the plastic and chemicals in which the fish has ingested. In the United States, California has become the first state to ban the use of plastic bags, joining countries such as Kenya, China, Bangladesh, Rwanda and Macedonia. In San Francisco, styrofoam cups, food containers, packaging peanuts and beach toys have also been banned. Meanwhile, France has become the first country to ban plastic bags, plates, cups and utensils. But plastic industries have made efforts to prevent these bans. In states such as Florida, Missouri, Idaho, Arizona, Wisconsin and Indiana, legislation has outlawed the plastic-bag ban. How can you help? Stop using straws! Over the last 10 years, plastic straws have escalated in production due to the “need” for them to “prevent” germs leading to disease. But the health risks that straws are claimed to prevent are nothing compared to those of which they are posing. Avoiding the use of straws is much easier than it seems; it just requires a little bit of effort and getting used to. Personally, I have stopped using both plastic straws and lids in eateries, and I have barely noticed a difference. The best part about ditching the plastic straw is that there are also other alternatives, including glass, stainless steel and bamboo. These eco-friendly straws are reusable and can be easily transported. The bottom line is that there is simply no reason not to switch to these straws or to stop using them altogether. The facts: 80% of ocean plastic comes from land-based sources, and about 8 million tons of plastic is dumped into the world’s oceans every year. By the year 2025, which is right around the corner, it is estimated that 10 times more plastic will be dumped in our oceans per year. Plastic pollution of oceans is a serious threat, and if we do not do something to take action soon, we are going to destroy our future. So the next time you go out to eat and you use plastic—which will likely be very soon—think about the harm that it is doing to our oceans and what you could do differently to help. "Yesterday, Charlie Stephenson provided me with the opportunity to photograph the most captivating cardinal in Alabaster, Alabama," writes Jeremy Black in sharing with us his shot of an extraordinarily rare Northern cardinal that Charlie had seen and videotaped earlier and agreed to help Jeremy find. "This yellow cardinal displays a rare mutation that causes the metabolic process to produce a different type of pigment than the typical red coloration. According to a biologist from Auburn University, this mutation is so rare that only one is seen each year in the United States." This remarkable sighting of an Iberian lynx—an endangered species of which there were fewer than 100 left as of 2002 because of overhunting, habitat loss, vehicle strikes and the decline of its main food source, European rabbits—was shared with us by Peggy and Marc Faucher. “Here are photos my husband, Marc, took yesterday of an Iberian lynx in the Sierra Andujar Mountains of southwestern Spain," writes Peggy. "After nearly 40 hours of our searching, this male appeared out of nowhere about 30 feet from us as we were walking down a dirt road. We observed him for about three minutes before he disappeared into a culvert under the road. He reappeared briefly on the other side but vanished into the thick bushes. "Iberian lynx are found only in Spain and Portugal. They're one of the rarest cats in the world. [Thanks to extensive conservation efforts] their number has grown to about 500 individuals. Their recovery is very much linked to a healthy rabbit population. In recent years European rabbits have been decimated by diseases such as Myxomatosis and rabbit haemorrhagic disease. Efforts are underway to eradicate these diseases to increase the number of European rabbits. Manatees can't survive for long stretches in water that's colder than 68 degrees, so they're crowding into canals with water reported to be in the low 70s. These herbivores (sometimes called sea cows) are a threatened species (controversially downgraded from endangered in March 2017) whose numbers fell to a few hundred by the 1970s because of habitat destruction, boat strikes, pollution and other human-driven factors. Thanks to efforts to protect them, their numbers have risen to more than 6,000 in Florida, but those same human threats continue. 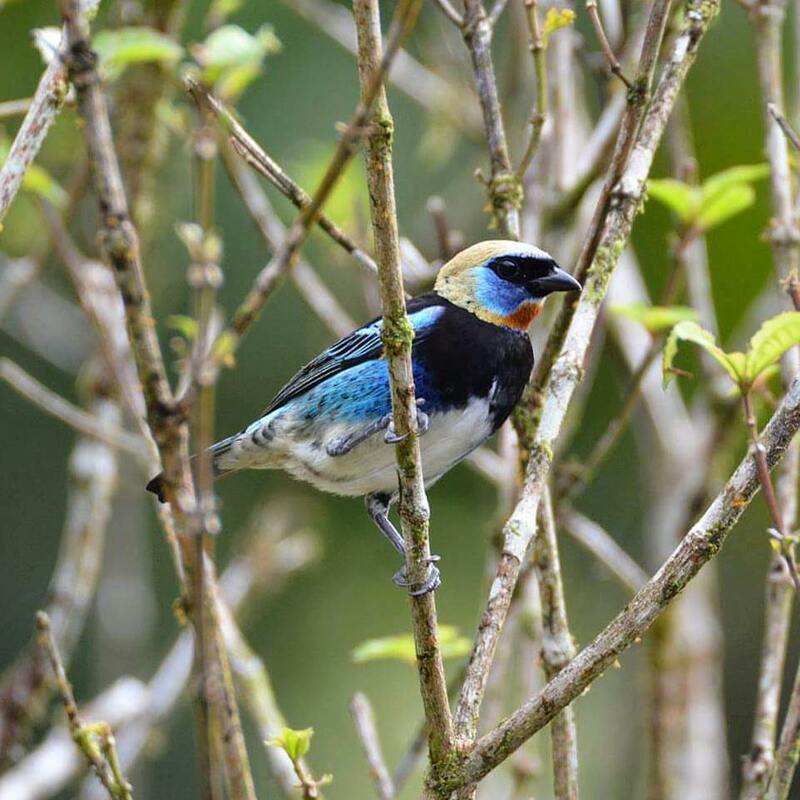 “This summer I was fortunate enough to spend one month in Costa Rica followed by one month in Panama," writes John David Curlis in sharing the wonderful photos in the slide show below. 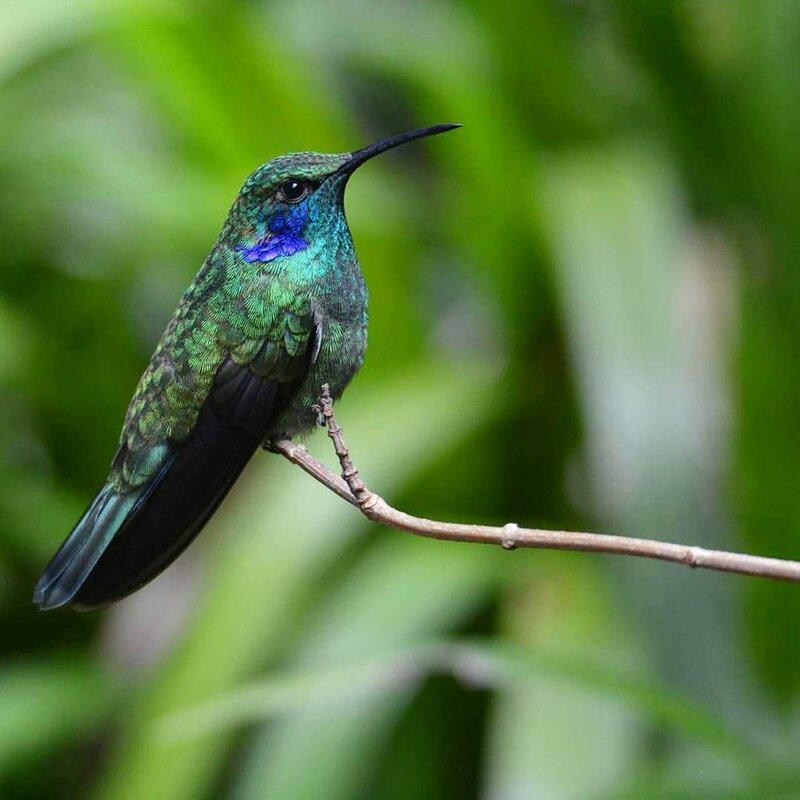 "When I wasn’t assisting with teaching [tropical ecology] or conducting research [on lizards], I spent just about every waking minute looking for birds. As you might expect, it’s not hard to find some truly amazing ones down there in the tropics. Here’s a sampling of some of my favorites—hope you enjoy!" We've put John David's identifications of the birds in the caption with each shot. 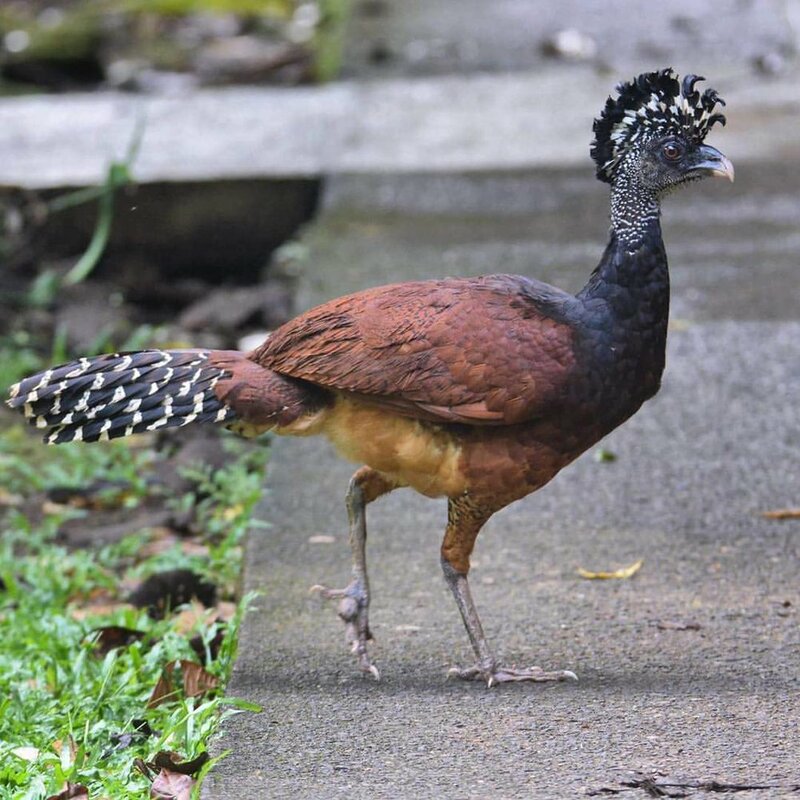 Species include everything from a Lesson's motmot and a great curassow to a golden-hooded tanager, a purple-throated mountain-gem and a fasciated antstrike. What a treat to see them. Many thanks, John David.